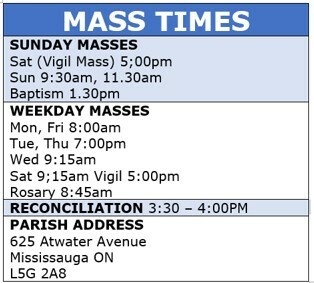 Please remember that Nov. 1 and 2 are feast days in the church. This year, we have purchased special candles to be placed in the candle holders. They have a space to put the person’s name on them. Only these candles will be accepted in the candle holders. Candles from the dollar store, for example, will not be accepted. The reason for this is that they catch fire and burn. Any candles, other than those sold at the office, will be removed and thrown out. The cost of the candles that we have purchased will be $7.00. They should be arriving shortly. The Book of the Dead will also be put out on October 27/28 for you to inscribe the names of the dead. Please keep November 24th free to attend our pasta dinner. Please remember that our youth group continues on October 26th. A young man who had the best the world could offer - wealth and security - came to Jesus because he lacked one thing. While he lacked nothing in material goods, he was nonetheless possessive of what he had. He placed his hope and security in what he possessed. So when Jesus challenged him to make God his one true possession and treasure, he became sad. He sought happiness and security in what he possessed rather than in whom he could love and serve and give himself in undivided devotion. Selling all that we have could mean many different things - letting go of attachments, friendships, influences, jobs, entertainments, styles of life - really anything that might stand in the way of our loving God first and foremost in our lives and giving him the best we can with our time, resources, gifts, and service. Material wealth will shackle us to this earth unless we guard our hearts and set our treasure on God and his everlasting kingdom. Where is your treasure?